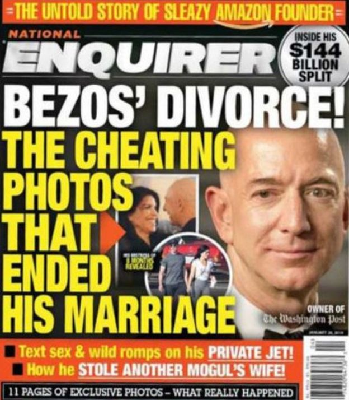 The tentacles of what could have been just an embarrassing expose of Jeff Bezos’ affair with intimate photos have crawled outwards to hook in Trump and Saudi Arabia’s bin Salman. 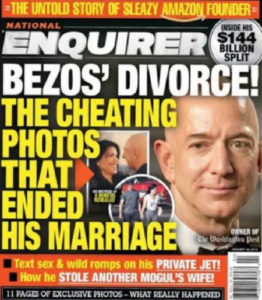 Bezos has suggested that his ownership of the Washington Post, which is fervently anti-Trump and employed the assassinated Jamal Khashoggi as a correspondent were perhaps behind the Enquirer’s sewer sweep. David Pecker, CEO of the parent company which owns the National Enquirer is a close buddy of Trump, responsible for ‘catch and kill’ stories about him is invested in Saudi Arabia, putting out puff pieces on the country and its young Crown Prince with no reference to human rights violations. 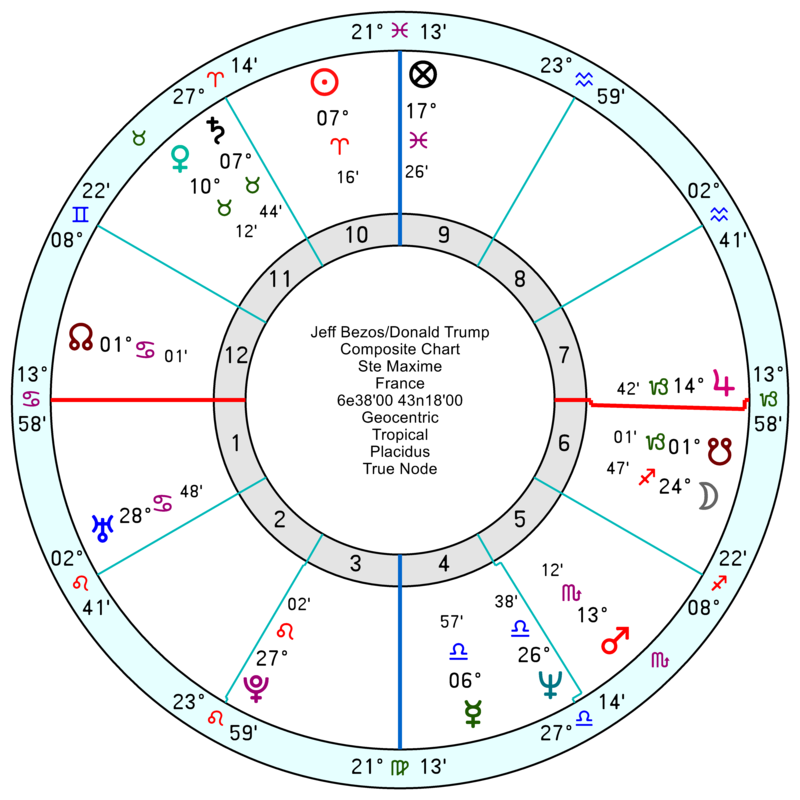 What astrologically eye-catching is that all three – Pecker, Trump and Bin Salman – have their Mars in last decan of flashy, flamboyant Leo which opposes Bezos’ more sober-sided, analytical Saturn Venus in Aquarius. 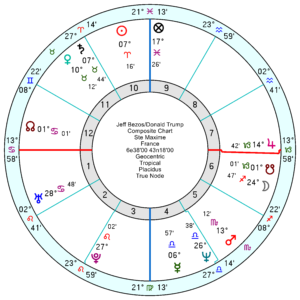 In Trump’s case his Saturn Venus in Cancer opposes Bezos Sun Mars in Capricorn for a gritty, irritable interface. 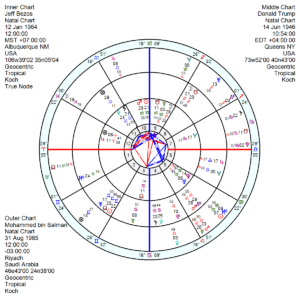 Pecker, 24 September 1951, has a ferociously determined and vengeful Mars Pluto in Leo which locks horns with Bezos Saturn in Aquarius and Pecker’s Neptune is in an evasive square to B’s Sun. 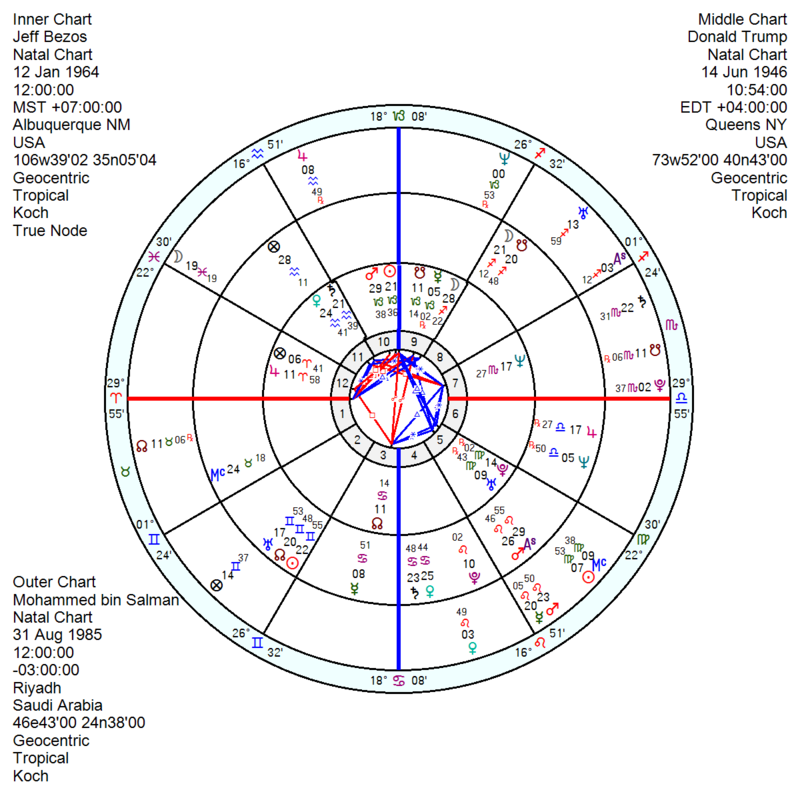 And Bin Salman’s Virgo Sun is conjunct Bezos’ rebellious Uranus Pluto. 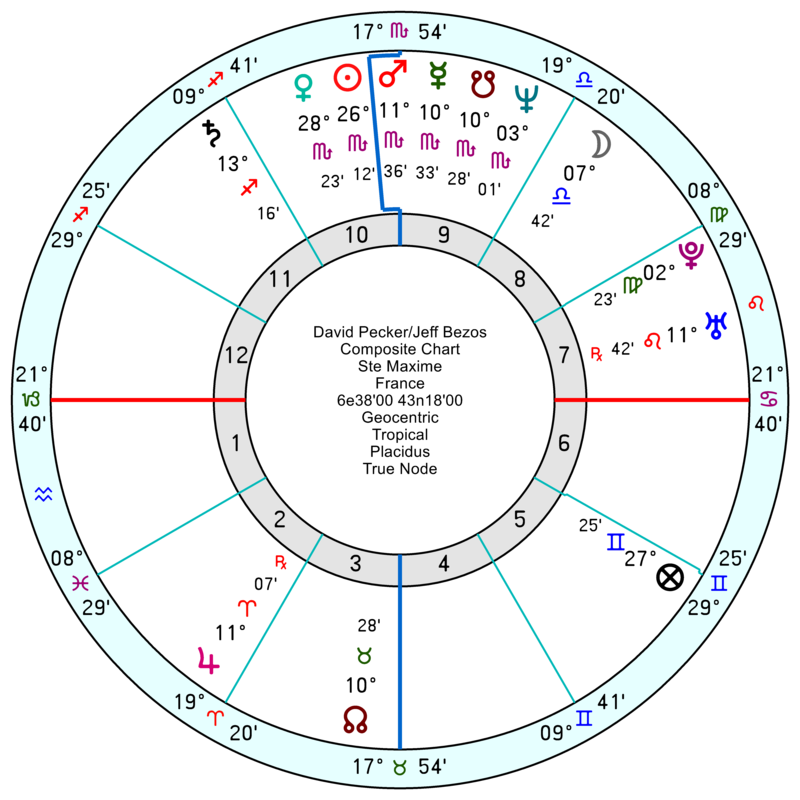 All the relationship charts between Bezos and the three are in essence combative and competitive and don’t look like settling into peace and equanimity anytime soon. Indeed if anything the early 2020s looks even more heated. 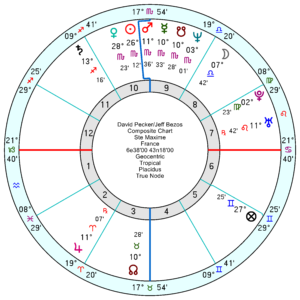 Bezos has guts and he’s fighting the good fight but he’s got a tough road ahead until Pluto exits Capricorn around 2024 since it will be conjunct his Sun this year, then his Sun/Mars midpoint, then his Mars which looks trapped and frustrated as well as at risk.